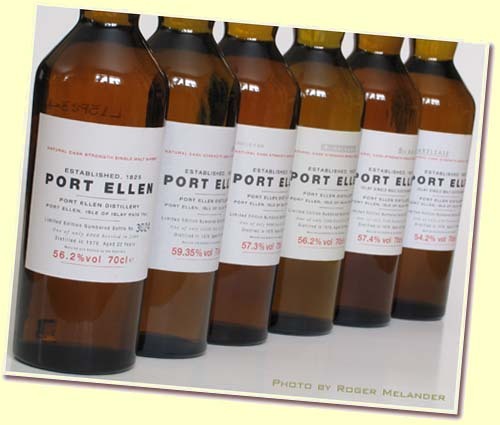 Quite recently I was fortunate enough to attend a tasting where the six to date annual releases of Port Ellen was tasted. This was arranged as another “online tasting” by the Swedish whisky forum. We simply gathered in an online chat room and wrote away while sipping the drams. Funnier than it perhaps sounds. In the ADHD section (the second E-pistle in issue #17, to be precise) you can read some more about the phenonemon if you’re interested. We were about 15 to 20 people this time and to put it short, had a great time. I had sampled some of these candidates before but never properly “analyzed” them and never put them alongside each other. This proved to be a somewhat challenging task as they required a lot of time and careful addition of water to arrive at their full potential. But once there, ah what a lineup of drams. Not the most easy-going of malts in other words, at least not if I can have my say… Rumours are saying that at least another four releases are due to be bottled annually in the forthcoming years. In the next epistle experiences from (at least) a full dozen other Port Ellens from Douglas Laing, The Golden Cask, Signatory, Bladnoch (!) and Dun Bheagan will be discussed. Anyway, back to today’s agenda. A considerably tasty and interesting experience, my observations follow. First impression is toffee, butterscotch and a little nougat, followed by clear coastal influences (seaweed and idodine – a little medicinal). It is also fruity with tangerines. Leathery, buttery and “old” tones are also there, very complex beast this. Tastewise the coastal and medicinal tones dominate more than the fruit (oranges in this case). Peat also. Rather uncut and tough which is something of the trademark of Port Ellen, most say. It ends quite peppery on the tongue. Lovely, although the nose beats the taste for me. Lands at 90 points. Dryish, almost like tinder. Coastal and peaty. Strong and a little herbal? Slight laid-back fruityness but the toughness dominates. Tastewise it’s a little burned and with very dry smoke. Medicinal and peaty, mainly in the after taste. Longish and even a little coffee at the end. A very clean and nice malt. The nose lowers the score a little but this one lands at 91 points. Chocolate, vanilla and laid back smoke at first. Then it opens up with a delicate fruityness which makes it soo round and elegant. Mighty vanilla, toffee, some licorice?, almost a little winey. Utterly splendid nose. Hugely oily dram this. Pure smoke and wood influenced spices, leathery and feels a little sherry influenced. Not the longest taste but pure pleasure. One of the most supreme noses I’ve ever had and with a taste that almost match, makes this a 93 points malt. Smoke at first, then some fruit (oranges and the like). Iodine and a little licorice – tar pastilles – not the sweetest one around. Strong. Very very spicy (white pepper). Smoke and fruit. Dry smoke that is. A little peatier in the after taste and some tobacco also. Long taste, turns slightly sour with the dry peat at the very end. Quite tough and very enjoyable, probably quite “Port Ellenish” in it’s style, 91 points. Big smoke but balanced by a little sweetness makes this one not quite as dry as some of the others. Saturated vanilla tones, peppery spicyness and a little toffeeish after a while in the open. Taste wise it’s more sweet, rounder but yet quite salty and the peat arrives late in the taste. Spicy, beautiful and clean. 93 points. Weird. Iodine and dryish fruits alongside each other. Very fresh and pure malt this one. But leather at the same time and loads of peat, probably the peatiest of the bunch. The iodine is clearly on the palate too, with peat and smoke making this one quite medicinal. Some hints of dried fruits at the very end, oily. 91 points. I must confess that I did not quite expect these high scores and consistent quality before the tasting. But we gave the whiskies loads of time and they dearly needed it. They were in the open air for well over two hours and changed constantly. To enjoy these fully one really should grant them the time (and splashes of water) needed. All of them undoubtedly world class bottlings. So my personal favorite was the fifth and third release, although all the others were just fractions away, very impressive. Quite a lot more conservative scores than mine there. Some even scored a few of these around 70 points. One reason may have been that most didn’t take the time needed, at least that’s my theory. Or, they just don’t have the same tastes as me! However unlikely that may sound ;).